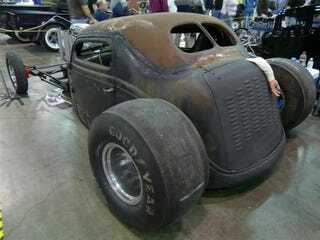 Well, the 2008 Detroit Autorama was a swell show this year, chock full of goodness for any hot rod persuasion. We saw all of the entrants for the Ridler award, a smattering of kit car action, and some very cool traditional hot rods. Hell, we even saw a Citroen 2CV stuffed with a small block Chevy mill. This show does nothing if not inspire its attendants to take on their own projects, push their own envelope, or build their personal dream car. Every year we go we see some new style take root, or a once dead branch sprout new growth - there's just so much good stuff here to see that we can't cover it all. And with that, we conclude this years coverage with a gallery of the things that got left on the cutting room floor. Full wrap up below the fold.